Play now Stick War 2 and return rebelled empires. The rebels under the leadership of the Magikill have become a more dangerous threat than ever and only you can save Order Empire. 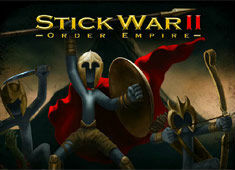 Stick War 2 is popular online war strategy game. In this game your task is to build an army and destroy the enemy’s statue before they destroy yours. Play now Stick War 2!